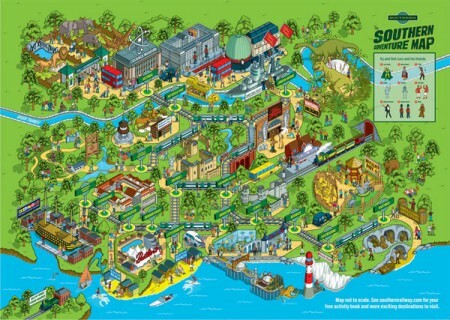 Rod Hunt has been working with advertising agency VCCP on the new summer advertising campaign for Southern Railway, imagining the rail network & many of the regions tourist attractions as a theme park. It’s being given away as a fold out map outside of many of the network’s stations. Can you find Loco Toledo, the campaigns Mexican Wrestler? Rod Hunt is an award-winning London based Illustrator and artist who has built a reputation for retro tinged Illustrations & detailed character filled landscapes. With UK and i… Show more. Send a message directly to Rod Hunt. Rod Hunt is an award-winning London based Illustrator and artist who has built a reputation for retro tinged Illustrations & detailed character filled landscapes. 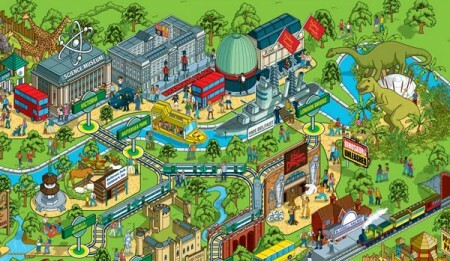 With UK and international clients spanning publishing, design, advertising and new media, he's illustrated everything from book covers to advertising campaigns, theme park maps, iPhone Apps and even the odd large scale installation too! Rod is also the illustrator behind the bestselling Where's Stig? books for the BBC's hit TV show Top Gear. Where's Stig? was the UK's 4th bestselling hardback non fiction book of 2009, and together all three books have sold in excess of 700,000 copies to date.